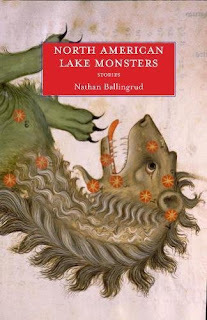 North American Lake Monsters is a collection of short horror or at least suspense stories. One short, The Monsters of Heaven, won the Shirley Jackson Award, and this book is on its third printing. Several of the stories introduce a monster, but the monster itself is inactive ... in one case, already dead, leaving these stories to be more about the evil we bring with us where the monster is just a catalyst or even excuse for some all-too-human transition into bad behavior. I'm still pretty new at this, but it feels that; to be honest about this review, I have to take a minute to talk about me and where I come from. I was around a lot of drug abuse in my younger years, and maybe this leaves me with little patience or even empathy for a person who brings their own evil, using something external as an excuse. There are many stories that centered around this, and those just left me feeling uncomfortable, and sad. Not horrified, scared, or even worried. When I recognize these patterns at the beginning of the story, then I already have my guard up. I cannot empathize with these characters. The turns, in these stories, felt like the inevitable. I say this with the highest compliment I can muster: I recognize these patterns, they ring true to real life, which means that the bored tropes of my own experience with the worst traits of humanity may indeed make wonderful fodder for those unfamiliar and seeking horror. Even so, some of the stories in this book feel like a premise has been introduced, but not fully explored. All short stories can feel this way, but -- reading over my own reviews -- I have little patience for when a story lacks a full narrative arc, and there were some stories where I felt like I read a promising chapter one, leaving me cold. Inside here, I disliked these stories: You Go Where It Takes You, S.S., The Monsters of Heaven, North American Lake Monsters and The Good Husband. This story was interesting, but not great: Wild Acre. Read this for The Crevasse, Sunbleached and Way Station if you find this collection on sale. As I note above, maybe the rest of this is exactly the kind of thing a horror fan might look for. At the same time, so many of these stories introduce something very strange or very interesting, steer the story around and away from that thing, while the short format doesn't allow those things to be expanded upon. Overall, I don't recommend this book. I'm actually quite tempted to do a spoilers version of this review to explain more on each of these stories from my perspective. Leave a comment if you are interested, or would rather I leave it spoilers completely off this blog.